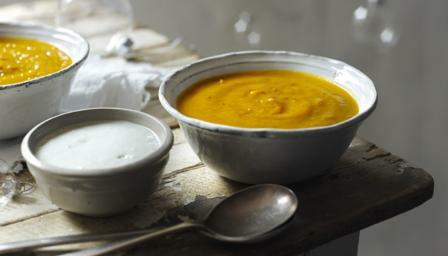 I have to have a regular supply of this squash and sweet potato soup at Christmas - it really is one of my freezer favourites. Allow the vegetables to cool slightly, then place half into a food processor and add 500ml/17fl oz of the vegetable stock. Blend to a purée and transfer to a large pan. Repeat with the remaining roasted vegetables and 500ml/17fl oz more of the stock - transfer the purée to the pan. Add the remaining 500ml/17fl oz of vegetable stock to the food processor and stir to catch any remnants of the vegetable purée, then pour into the pan.